Big Top provides fabric structures for companies in the mining and mineral industries that need a safe warehousing facility for their materials. One of the reasons why we are sought out again and again is due to the versatility and protective nature of our tensile shelters. 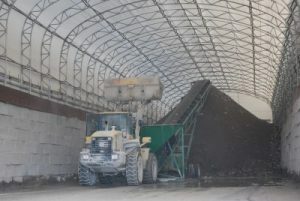 Because mining and mineral companies often have their productions out in the field, they need a warehousing structure that can be easily transported, assembled quickly, and will hold strong through many seasons of weather. Our tension warehousing shelters can be stored neatly for easy transport and can be assembled quickly, using almost any type of anchor as a foundation. Thanks to their modular design, they can be nearly any size you require for your warehousing needs. If your production needs to relocate, your shelter can be conveniently disassembled and relocated to another location. The hallmark feature of our tensile structures is the fabric roof, which protects your staff and materials from sun exposure by blocking 99.5 percent of harmful UV-A and UV-B radiation. The ultra-durable galvanized steel frame will hold strong no matter what the weather brings, and we can even add engineering for heavy snow and wind loads. Due to the radiation-blocking fabric roof, your shelter will maintain a comfortable interior temperature that is, on average, 15 degrees cooler in the summer and warmer in the winter than the outside temperature. However, if your materials require a climate-controlled environment, we can add an HVAC system and insulation to meet your needs. The fabric roof is also translucent and will allow natural sunlight to flood your warehousing space, reducing energy costs by eliminating the need for electric lighting. Learn more about how our fabric structures are used as warehousing spaces by companies in the mining and minerals industries by contacting Big Top today.